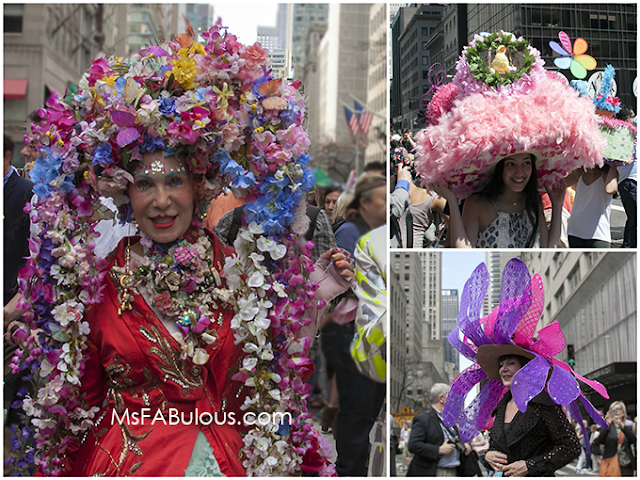 New Yorkers will take any excuse to dress up. 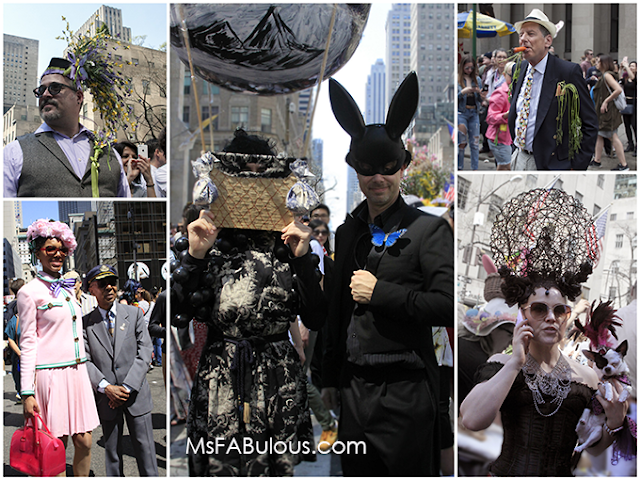 The NYC Easter Parade is a tradition for the fashionable to flaunt their style that dates back to the 1870s. 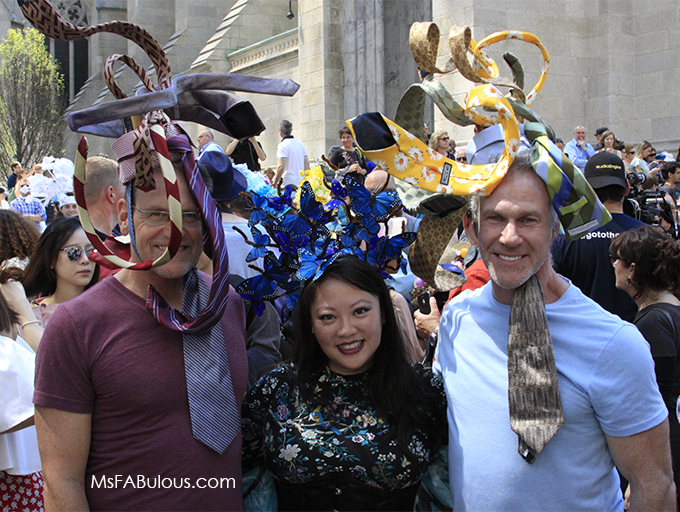 The head gear has evolved way beyond an elegant bonnet and has expanded to wearable art, fashion designer masterpieces, protest symbols or an afternoon of family crafts. There's me in my butterflies that I made the night before. I was inspired by the Philip Treacy hat that was part of Alexander McQueen's Fall 2009 show. I was flanked by two gentlemen who created a headpiece of gravity defying ties. What a great way to incorporate menswear for masculine style if you're not into flowers! Otherwise, many parade revellers live by the "Go big or go home" motto. They created dramatically large hats to dominate Fifth Avenue. 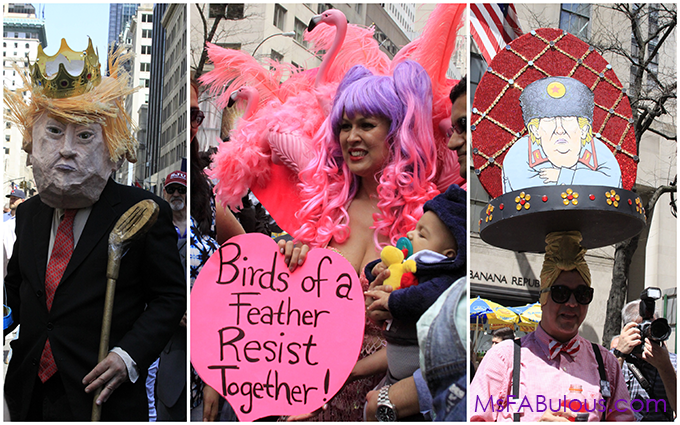 Unsurprising trends were outfits and hats that protested the current administration. One of the most popular was a pouting, childlike Trump mask. Another protested Trump's ties with Russia by incorporating him into Faberge inspired Easter eggs. Others used more generic protest imagery that corresponded to their outfit. 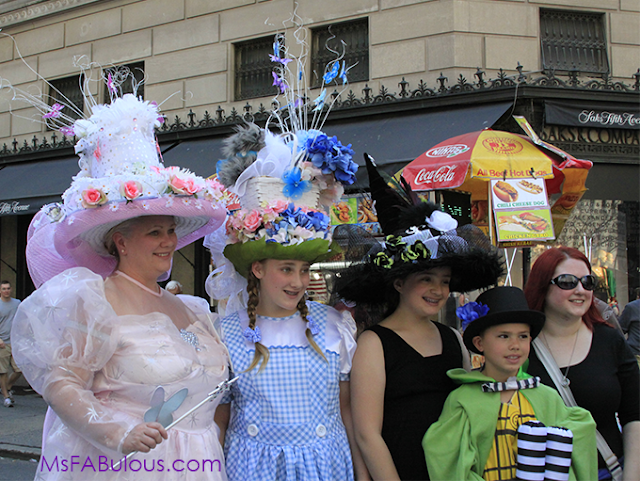 A popular trend this year was The Wizard of Oz. I found lots of groups who were inspired by this story for Easter. Bonnets were depicting different scenes or characters from the story. There was a giant diorama on one person's head that included all of the characters. Different parade guests dressed as their favorite character from head to toe. I always thought Alice in Wonderland would be the go-to Easter story, but I was wrong. As this is New York, some of the best looks were carried off with the appropriate attitude. There is my handsome husband in dapper tails and slick black derby and rabbit mask next to a Tim Burton-esque outfit depicting a hot air balloon. I love the multi-generational preppy duo at ease on the East Side. The older gentleman at the top right was a favorite of everyone at the parade for his sassy attitude with orange-dyed cigar carrots that he smoked and kept in his pocket. The NYC Easter Parade counts as one of the best (free!) events of the New York. There is great history, celebrates fashion and creativity and inclusive to anyone who wants to watch or join. Which look was your favorite?